November 2013 was a solid month for the Kansas City area. Employment jumped by 3,000 from October and now stands at 1,011,200 — up by 13,000 from one year ago. This also marks the highest employment level the KC metro has seen in four years. The Professional Business Services sector has been a key driver in our region’s employment growth, adding nearly 6,000 jobs in the year ending in November. Construction was the second biggest growth sector, as it added 3,300 jobs. The biggest losses were felt in the retail sector, which lost 4,600 jobs. The seasonally adjusted unemployment rate achieved a bit of a milestone in November as it dropped below 6 percent for the first time since August 2008. Now at 5.9 percent, we have lower unemployment than all but four of our peer metros (Austin, Oklahoma City, Minneapolis-St. Paul and Omaha). As the unemployment rate dropped, so did the help wanted ads. After peaking at more than 16,000 ads in October, regional job postings dropped below 12,000 in November. This number tends to be very sporadic, so our guess is this is just a one-month hiccup. So, overall, a pretty good employment data month for Kansas City. 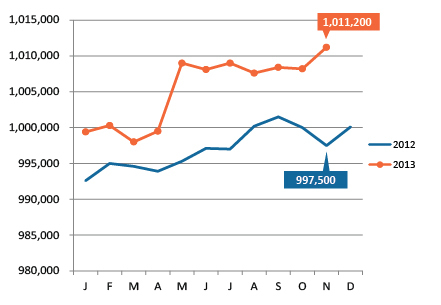 Local employment topped 1,010,000 in November. 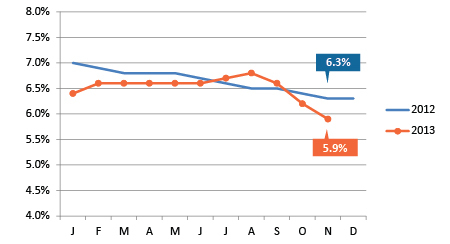 The unemployment rate dropped to 5.9 percent, our lowest point since August 2008! 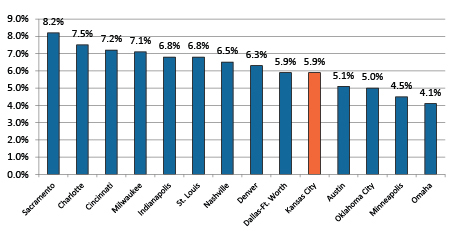 Kansas City's unemployment rate remains in the lower half of our peer metro group. 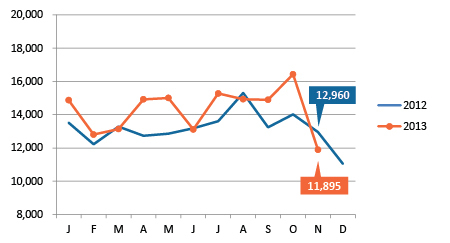 After spiking in October, job postings dropped to just under 12,000 in November.